Just a short time ago, your love knelt down and gave you a ring. You, of course, said yes and got straight to planning! From engagement parties to bridal showers, Blue Bridal Boutique has hosted it all. We have a cute yet elegant space that’s perfect for your dream party — and you can get some wedding dress shopping in while you’re at it! Visit us in Denver to see the location, and then get busy sending out invitations! Here are four reasons why you should use as a venue for your bridal-related parties. We have natural light and greenery. If you want the aesthetic of your party to be intimate and fresh, we’re the place for you. With natural light streaming in the windows and lots of greenery, you’ll have just the ambiance you were looking for. This also means we have the space for you to bring in more flowers for the event. What’s better than plants and flowers galore to celebrate love? We have lots of space. There’s nothing worse than finally having all your friends in one place together but being too cramped to enjoy yourselves. Blue Bridal Boutique has an open floor plan that will let all of you comfortably move around and enjoy each other while still having an intimate, close feel. Don’t try cramming all of your friends into your tiny apartment for the day. Go ahead and book with us, and there’ll be enough space for everyone (and you can browse pretty dresses at the same time!). You can start wedding dress shopping. This is the dress you’ve dreamed about for years! You can’t see all your dress options in simply one visit to the bridal store. By booking with us for your engagement party or bridal shower, you can get a headstart on saying yes to the dress and explore all of our exquisite designer dresses. Do you love a good mermaid style, fall head over heels for a backless wedding dress, or are you a sucker for vintage wedding dresses? Explore these styles and more with your closest friends by your side. We can help with party favors and food. Make your bridesmaids’ lives a little easier and let us take care of the party favors and food. We have brunch or evening packages, tiered bridal shower packages, a la carte options and DIY favor menus. With all of these tools, we aim to help simplify your life so you can focus on the wedding aspects that bring you the most joy. Limited dates are available, so reach out to us today so we can help your engagement party or bridal shower dreams come true! Pricing is upon request. 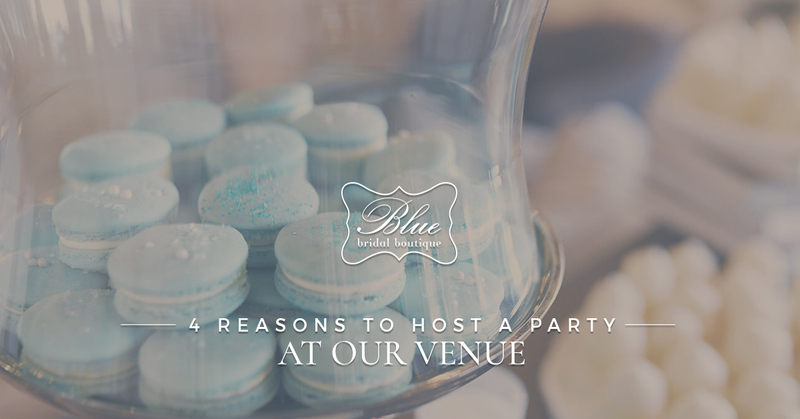 We first began using Blue Bridal Boutique as a venue when we realized there was a lack of affordable venues that offered the intimate aesthetic and environment we felt they should. Now, we’re happy to offer Blue Bridal Boutique for your bridal party in the Denver area. It has space for wedding activities, food and drinks, and just the right vibe; you might even find your wedding dress while you’re here! If you’re too busy enjoying friends and food while you’re here though, we’ll be sure to help you find the perfect dress at another appointment.